Who among us has never stopped in front of a street vendor mouth-watering over fresh oranges, roasted chestnuts, fluffy cotton candy, and the list is endless! I love the way in Lebanon, street food merchants display their goods. When a fruit or a vegetable is in season, here they are, conveniently scattered everywhere, making sure you bump into one of them before you reach home. No matter what direction you’re driving in! And the best part about it, Sweet Heaven, you don’t have to leave your vehicle; Free Car Delivery! I think best sellers in Lebanon are fresh fava beans (a.k.a. broad beans)! Place the hulled strawberries in a big salad bowl and cover with sugar. Let it rest for 10 hours, preferably in the fridge if the weather is hot. In a heavy based saucepan transfer the syrup without the strawberries and bring to boil for 10mn on a low flame. Add the strawberries and the lemon juice and cook for about 25mn or until a small amount of the juice gels on a chilled plate. Pour carefully in jars and keep refrigerated. Consume within a month. Tip: If desired, one extra cup of sugar can be added to increase the quantity and sweeten the flavor. 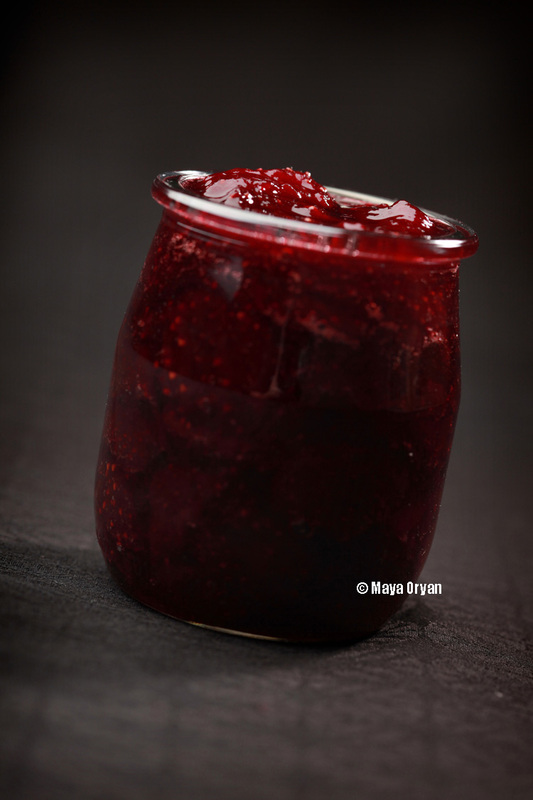 This entry was posted in Desserts, Recipes and tagged desserts, Food Blogger, food photography, Food Styling, Food Stylist, Lebanese food, lebanese food blogger, Lebanese food stylist, Maya Oryan, Mayas Ingredients, meghleh, Pantry food, pectin, Preserve, Spreadable jam, Strawberries, Strawberry Jam, sweets by Maya Oryan. Bookmark the permalink. Looks so delicious! You inspire me to make my own jam, and hopefully someday soon too. If you’re doing a small quantity, you can always reduce the sugar to 400g per kilo:) Good luck!